1) Myanma Oil and Gas Enterprise (MOGE), created in 1963, control upstream activities in oil and gas exploration, as well as transmission of domestic gas. 2) Myanma Petrochemical Enterprise (MPE) operates three refineries, four fertilizer plants and several other processing plants. 3) Myanma Petroleum Products Enterprise (MPPE) handles retail and wholesale distribution of petroleum products. In 1998, Myanmar passed foreign investment legislation which attracted foreign investment and outside technology to revive its oil and gas industry. Currently, almost 46 onshore exploration blocks are being operated, with more than a dozen being developed by foreign companies. Substantial exploration and production work are also active in offshore areas. In 2007, nine foreign oil companies were involved in 16 onshore blocks in exploring new areas (EP blocks), to enhanced recovery from existing fields (IOR blocks), to reactive fields where production has been suspended (RSF blocks) and to produce (PSCs). In the offshore areas, Total, Petronas Carigali Myanmar, Daewoo, PTT-EP, China National Offshore Oil Corporation, China National Petrochemical Corporation, Essar, Gail and Rimbunam (Malaysia), ONGC (India), Silver Wave Energy, Danford Equities (Australia) and Sun Itera Oil & Gas (Russia) are exploring and/or developing 31 blocks. The Ministry of Energy currently operates three processing plants. There are Thanlyin (20 000 bpd); Chauk (6 000 bpd) and Thanbayakan (25 000 bpd). According to the 2010 BP Statistical Energy Survey, in 2009, Myanmar had proven natural gas reserves of 0.57 trillion cubic metres, 0.3% of the world total. 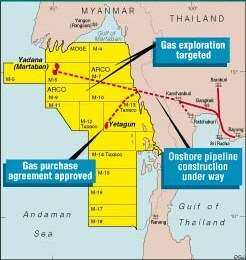 Myanmar had 2009 natural gas production of 11.54 billion cubic metres, 0.38% of the world total. The Ministry of Energy is planning to construct an LPG extraction plant of 300 000 mtpy capacity using offshore Yetagun natural gas as feedstock. Yetagun natural gas field discovered in Blocks M-12, M-13 and M-14 of Taninthayi Offshore Area has recoverable reserve of 3.2 tcf of natural gas and 84.8 mmbbl of condensate as the field contains wet gas. The Ministry of Energy is planning to construct a new polyester plant using offshore Yetagun natural gas as feedstock. This plant will produce polyester fibres, polyester films, resins, plastic and other petrochemical products. The estimated cost of this project is about US$ 600 million to US$ 800 million. Also in the planning stage is a programme to effectively transport crude oil and petrochemical products to Thanlyin Refinery. Due to the limited depth of the Yangon River, crude oil has to transport from carriers via shuttle tankers to the Thanlyin Refinery. A possible solution being studied by the Ministry is to use a single mooring buoy at the mouth of the Yangon River and have a pipeline linking it to the Thanlyin Refinery.